KAIROS is truly honoured to have hosted ten partners at the inaugural Women of Courage: Women, Peace and Security global partners gathering in Toronto and Ottawa, November 19 – 27. 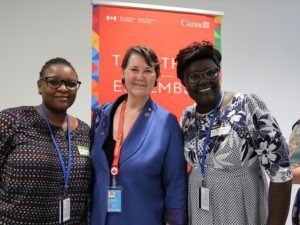 The gathering highlighted the critical role that women’s grassroots organizations play in international peace building. The partners were from Héritiers de la Justice – Democratic Republic of the Congo, Organización Femenina Popular – Colombia, South Sudan Council of Churches National Women’s Programme – South Sudan, Wi’am Palestinian Conflict Transformation Center – Palestine, and National Council of Churches – the Philippines. 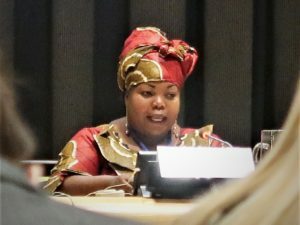 In a series of meetings and public events, the partners spoke about their work with grassroots women, building peace and addressing gender-based violence in some of the longest and most egregious contexts of militarized conflict in the world. They shared contexts about war, occupation, the impacts of conflict on women, and emerging intersectional oppressions that continue to subjugate women’s voices and spaces, such as the normalization of patriarchal systems and oppressive power dynamics. Despite diversity in these contexts and the work of partners, they shared much in common both in terms of the impact of militarized conflict on women and how women are responding. 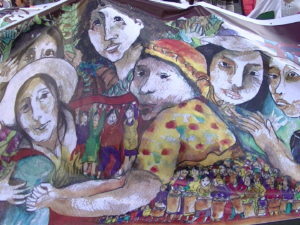 For example, when women victims or survivors are provided with the support that they need to heal, reclaim dignity and assert their rights (including psycho-social services, trauma healing and coping, legal services and human rights training), they themselves can become active peace builders and human rights defenders. The Women of Courage program brings partners together around these commonalities. To kickstart the 16 Days of Activism Against Gender-Based Violence, KAIROS hosted a special Women of Courage reception in Toronto to honour the partners’ work, as well as the KAIROS network and donors who have been steadfast in their accompaniment and support. This year’s theme, Orange the World: #HearMeToo carries the urgency to heighten awareness and increase momentum to eliminate violence against women and girls. The partners agree that violence against women is systemic and often due to other forms of discrimination. Among their messages at the reception was the assurance that KAIROS’ Women of Courage: Women, Peace and Security program helps grassroots organizations address violence, discrimination and other underlying issues. 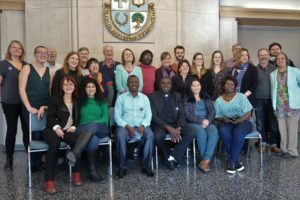 On Sunday, November 25, the International Day for the Elimination of Violence Against Women, at churches in Toronto and Barrie, the partners explained how they work for peace in their respective regions and called for stronger mobilization in combating and eliminating all forms of violence against women. Beyond raising awareness, the partners also expressed gratitude for the sustained efforts and continued support from engaged citizens in looking for collaborative ways to address endemic violence around the world. Throughout the gathering, the partners highlighted common themes and successes. 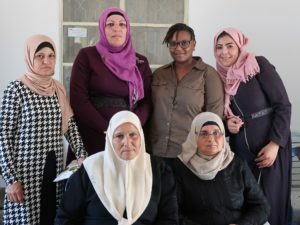 Women in communities are finding the courage and resolve to break stereotypes, disrupt power structures, and organize as collectives towards conflict prevention and peacebuilding. When women are empowered, they are emboldened to become agents of change in their communities. Some become human rights defenders (HRDs). Youth play a pivotal role in peace initiatives and contribute unique perspectives and ideas. In recognizing the voices and power of young people the partners are investing and engaging with youth in efforts that are transforming them to become change makers in their communities. “What will our children and coming generation inherit from us? 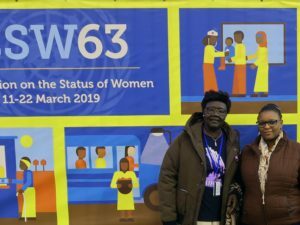 The people of South Sudan have lived through decades of conflict but deliberate conversations with our youth is teaching them about humanity and has also prevented their recruitment into violent extremist groups,” Agnes Wasuk, South Sudan Council of Churches National Women’s Program Coordinator. Partners also had the opportunity to participate in a tri-lingual KAIROS Blanket Exercise held at the Native Canadian Center in Toronto and learned about the history of colonization and cultural genocide of Indigenous Peoples in Canada. 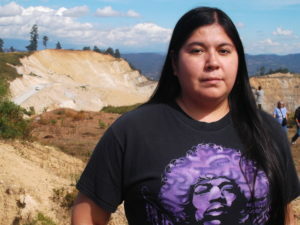 This was an emotional and powerful moment and many partners drew parallels with their own histories of colonization.